​ Since 1977 Hy-Lok Canada has been a proud manufacturer and supplier of fitting and valve products for clients spanning a wide variety of industries across the globe. Our industry leading solutions cover a long list of specifications and are crafted with the highest quality and performance in mind. 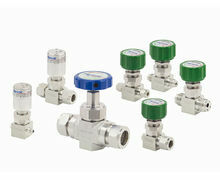 Learn more about our products, including the advantage of Hy-Lok’s line of bellow valves below. At Hy-Lok, we know the value of components you can trust. Each of our products are manufactured to meet the highest industry standards. Our team maintains several domestic and international certifications to ensure we are properly equipped to design solutions that are forward thinking and built to stand the test of time. With a focus on manufacturing products that are competitively priced without sacrificing quality, the Hy-Lok brand has earned its reputation for excellence within the industry. Our line of bellow valves are designed to meet the extreme conditions of gas and liquid systems while providing a long life cycle you can depend on. Our valves easily accommodate full system pressures with stability and safety, with each component is guaranteed to be clean and suitable for use in sterile environments. Hy-Lok bellow valves are simple to mount on panels and have handle options that include round and toggle, as well as pneumatic actuation. Ball bearing application between the upper and lower stem ensures smooth operation, and the bonnet of the component seals to the body without a gasket. Crafted with 316L stainless steel, Hy-Lok bellow valves valves offer an operating temperature rating of -20°F to approximately 200°F and a maximum working pressure up to 250 psig (17.3 bar). To ensure components are pure, metal bellows sealed valves are assembled in a class 10 clean room and passivization is done in a nitrogen environment. Valves are also 100% helium leak tested before leaving the factory. Learn more about our products by contacting Hy-Lok Canada today.